Made these last night. I did add two sweet sausage to the recipe I would add more next time. Easy to do and froze the extras for later. Bring brown rice and water to a boil in a saucepan. Reduce heat to medium-low, place a cover on the saucepan, and simmer until the rice is tender, about 40 minutes; transfer to a large mixing bowl. Heat a large skillet over medium-high heat. Break ground beef into small pieces and place in the skillet. Add onion, mushrooms, and garlic; cook and stir until the beef is completely browned, 7 to 10 minutes. Mix beef mixture into brown rice. Stir tomato sauce, diced tomatoes, tomato paste, and Italian seasoning into the rice mixture and season filling with salt and black pepper. 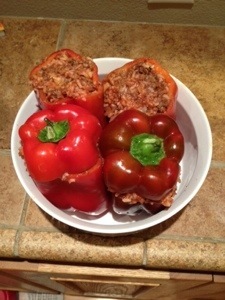 Arrange bell peppers in a baking dish. 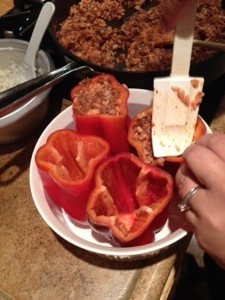 Spoon filling into bell peppers. 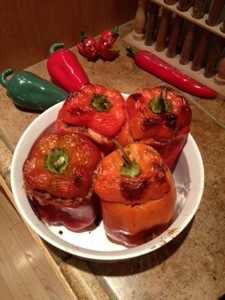 Bake in preheated oven until the peppers are tender, about 1 hour. Sprinkle Parmesan cheese over the stuffed peppers to serve. Tonite I made real live pizza with home made crust etc. 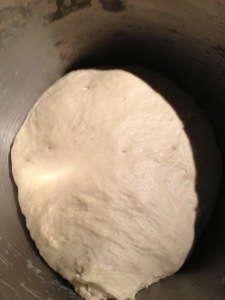 Here is my crust recipe: Jay’s Pizza crust its not too hard… requires about one hour and twenty minutes of rising time. 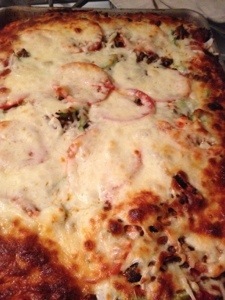 After that add your favorite sauce and ingredients… I used Rinaldi Tomato Basil sauce. And I added thinly sliced green bell pepper, tomato , onion, and sauted mild italian sausage. Delicious! Ok another crock pot effort. I put together a stew for tonight.. using a new base I discovered some time back. Brown meat and throw it along with all other ingredients into a crock pot and heat through.